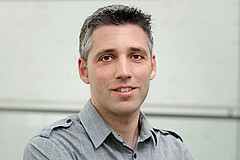 Dr. David Vilchez’s laboratory is focused on defining the mechanisms underlying protein homeostasis (proteostasis) regulation in stem cells. The final goal is to determine whether intervention of these proteostasis mechanisms slow down aging and protect from the symptoms associated to age-related pathologies by using C. elegans as a model organism. Our research: Mechanisms that promote proteostasis slow down aging and decrease the incidence of age-related diseases. Since human embryonic stem cells (hESCs) replicate continuously in the absence of senescence, Dr. Vilchez and his team hypothesize that these cells can provide a novel paradigm to study proteostasis and its demise in aging. The scientists mimic proteostasis of hESCs in somatic cells (e.g. C. elegans) to examine whether intervention of these mechanisms modulate healthspan and ameliorate age-related diseases. Our successes: The research team discovered that hESCs exhibit high proteasome activity. This activity is necessary for hESC identity and their differentiation into neural cells. Moreover, they have uncovered that RPN-6, a key proteasomal subunit, is required for this activity and its mode of regulation and conservation in the aging process of C. elegans. Their findings established RPN-6 as a regulator of proteasome activity and a determinant of healthspan, providing a powerful candidate to correct proteostatic deficiencies in Huntington’s disease. Moreover, their results in C. elegans led them to find that FOXO4, a longevity transcription factor, regulates proteasome activity and is necessary for neural differentiation of hESCs. Thus, their findings established a novel regulation of proteostasis that links longevity in invertebrates with hESC identity. Our goals: Dr. Vilchez and his coworkers aim to define the mechanisms that maintain proteostasis in stem cells. Their final goal is to apply this knowledge for the discovery of pharmaceutical targets to ameliorate Alzheimer’s, Parkinson’s or Huntington’s disease. Our methods/techniques: The Vilchez lab uses an interdisciplinary innovative approach that combines stem cell research with genetics in C. elegans. 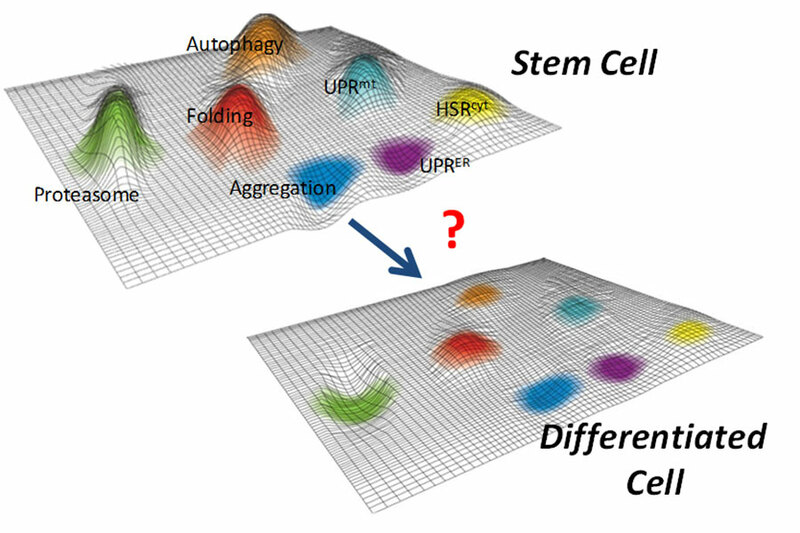 Figure 1: We hypothesize that stem cells could have increased mechanisms to maintain the stability of their proteome. Proteostasis landscape schemes adapted from Douglas & Dillin (2010). 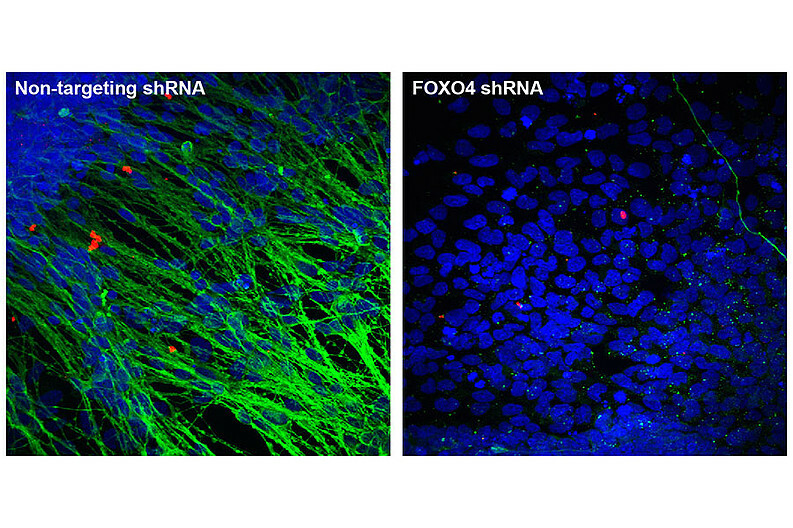 Figure 2: FOXO4, a forkhead transcription factor, regulates proteasome activity in human embryonic stem cells (hESCs) and is necessary for hESCs differentiation into neural cells. Therefore, our results establish a novel regulation of protein homeostasis in hESCs that links longevity and stress resistance in invertebrates with hESC function and identity (Vilchez et al, 2012b, Vilchez et al 2013). Representative images of immunocytochemistry after neural differentiation assay. Neuronal marker: β-III-tubulin, green. Nuclear staining: DAPI, blue Staining: David Vilchez, Leah Boyer.